WHEN I WAS A KID—six years old—I had a classmate named “Frederika.” A fine name, my six-year-old self thought, and, promptly, I renamed myself for her (although my parents never quite caught up). Then, at twelve, I first heard the name “Zoë.” That was it! A perfect name for me. But, again, my parents wouldn’t sign on, and the Zoë I could have been died an unremarked death. In an earlier blog post, I talked about POEMCRAZY, in which author Susan Wooldridge discusses the act of renaming as a way to resuscitate some aspect of ourselves that may be starved for oxygen. “New names seem to change people,” she says. Today, it’s tossing helium dream. My parents named me for a racehorse, Jamie K., who gave Native Dancer a run for his money in the Preakness and the Belmont a few years before I was born. This naming, perhaps, explains my early interest in horses—in a family in which no one else has ever ridden or owned a horse. And while that’s a fun story, and “Jamie” is a perfectly acceptable name, I have always wondered…. If I had lived my life as a Frederika or a Zoë—or even as a Grace or a Claire—would I have experienced the world differently? I guess I’ll never know. Because, ultimately—unlike actress Sigourney Weaver, who, born “Susan Alexandra Weaver,” renamed herself, at the age of 14, after a minor character (Sigourney Howard) in F. Scott Fitzgerald’s novel THE GREAT GATSBY—I let the name I was given harden around me. Until, now, it’s hard to tell where my name ends and I begin. How about you? What secret names do you have hidden in the roll-call of your deepest self? Make a list of them! Next, write out a pivotal scene from your life as you remember living it. Finally, take one of your secret names and begin a third-person account of the same situation, starring someone who bears a strong resemblance to you, but who answers to the name you chose. Allow the scene to deviate from the one you remember—and allow your other-named self to experience a different outcome. My BFF from wild-childhood just turned 60. Which means—guess what—I’m not far behind. According to my periodontist (my relationship with whom is, in itself, worthy material for a blues song), I’m gearing up for a third gum graft. If you look closely enough (and please don’t) you can see that my hair is thinning at the part. Okay, now let’s turn our blues into blues LYRICS! If you’ve shuffled along this far with me, and want to learn more about the blues, check out PBS’s Blues Classroom and Danny Chicago’s “How to Write the Blues”! MUSE DISAPPEARED? NEVER FEAR! 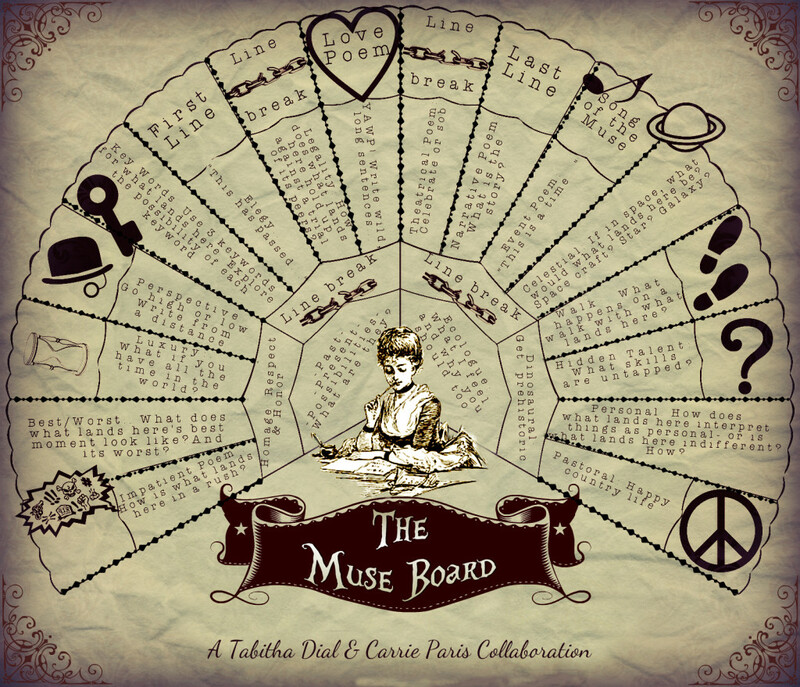 Tarot poet Tabitha Dial and oracle creator Carrie Paris present … a muse you can fold into your pocket: The Muse Board! The Muse Board’s playful directions jump-start creative-writing adventures. Click the image for your free, downloadable Board and print it. Then, like Arriety in THE BORROWERS, collect tiny household objects for game pieces. A needle threader, an acorn from last fall, a bead, a bullet (eek! ), or an incense cone, will do nicely. Or ransack your game closet for Monopoly tokens or Scrabble letters. After gathering your charms, toss a few onto The Muse Board. Now, free-write about the interface between your charms and the directions on the spaces where they fall! Have dice? Tabitha says, Toss a die or two before casting your charms. Let your roll indicate the number of sentences you’ll write, the words per line for a poem, or characters per story. I FIRST HEARD PATTI SMITH’S ALBUM HORSES at my friend Barbara’s flat in Watertown, Massachusetts, where she lived with her guitarist roommate, John. We were all musicians, then. Or artists. Poets. Dancers. And we each had our own god. Mine was Talking Heads. Not least because they had a girl bass player and I was a girl bass player. Bebe’s god was Patti Smith. Not least because Beebs looked a bit like Patti. Back then, the early 80s, we were not so far from living the life Patti Smith writes about in JUST KIDS, her National Book Award-winning memoir of her NYC years with Robert Mapplethorpe. Well, except for the fame and critical acclaim. Except for that. But then . . . my band broke up, and I became an office manager, and Barbara moved out of Watertown and went to work for Houghton Mifflin, and Barbara’s roommate became a high school English teacher, and our poet friend became a programmer. And Patti? For a while, she, too, ducked her rock-poet-goddess status, slipping off to suburban Detroit with her husband, Fred “Sonic” Smith. But even then, unlike me—or Barbara, or the other dancers/musicians/writers among us—Patti Smith kept on. She wrote. She recorded. And when Fred Smith died in 1994, Patti Smith came roaring out of the suburbs, touring and releasing ten albums in twenty years. What’s the difference between Patti Smith and those of us of whose art/music/poetry washed out with the tide of the 1980s? I’m not sure. Not sure the difference between those who do and those who just used to. Maybe there’s a clue in JUST KIDS. I don’t know. But I do know this: Patti Smith, still writing, still rocking, is—still—a fierce god to follow. WITH ITS 78 (DRAMATIC!) ILLUSTRATIONS of human experience, it’s no wonder poets find inspiration in the tarot! For instance, when poet and tarot reader Tabitha Dial needed a fresh take for her poetry thesis, she dug out her Universal Rider Waite tarot deck to prompt her—and created from those prompts the book-length collection of poems she needed to complete her degree! Now a tarot reader with an MFA in poetry, Tabitha teaches others how to use the cards for inspiration. She suggests we pick a card, start by listing its visual elements, and see where that takes us. Lists, she says, can be powerful and stand as their own poems—take for example [Tabitha’s poem] “The Banner (The Sun),” [which] stems from descriptions of the image and lays claim to a more general idea of what it may symbolize at the end. as to make your heart pound in your throat. I REACH FOR SUSAN GOLDSMITH WOOLDRIDGE’S POEMCRAZY whenever I need a dose of creative encouragement. Wooldridge invites such playful abandon with words, it would be a stiff upper lip indeed that didn’t curve reading her! In “The Answer Squash,” Wooldridge talks about labeling objects in her home with word tickets. A squash in its basket bears the label answers, and a worn scrub brush at the sink, diamonds. Like all innovative use of language, these labels make one rethink the objects to which they are attached—see them in a new light. Try it yourself! Make a batch of scrap-paper labels and affix them, willy-nilly, or with poetic precision, on items around your abode. Take a break for a cup of tea, then wander up to one the newly-christened items and find some writing inspiration in the quirky tension between the object and its moniker. Alternatively (or additionally), add a word ticket to your mirror. How does what the word say alter how you see yourself? Start writing to find out! POET. PHILOSOPHER. PROFESSOR. PSYCHOTHERAPIST. And, oh, yeah, Montana farm-boy! All these hats hang on Gary Whited’s hat rack. Gary’s poems have appeared in SALAMANDER, PLAINSONGS, THE AUROREAN, ATLANTA REVIEW, and COMSTOCK REVIEW. His collection, HAVING LISTENED, won the 2013 Homebound Poetry Prize and a silver medal in the 2014 Benjamin Franklin Book Awards. What gives this love-song to the prairies of Eastern Montana its heft and depth is not only the poet’s deep affection for ‘rattlesnake skins fluttering in the wind’ and ‘the perfection of still water’ just below the muzzle of his father’s white horse, but the way this love occurs amidst the disturbing sorrows and unspoken loneliness of these families in their struggles with themselves as well as the land…. HAVING LISTENED has recently been translated into Russian—which is appropriate, as Gary will be teaching in St. Petersburg this spring! But wherever he goes—from Montana, to Massachusetts, to the far reaches of Russia—Gary always carries the prairie inside him.